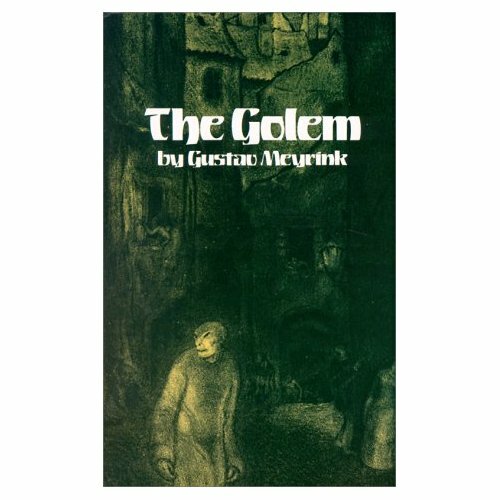 Though the word itself has biblical roots, the tale of the Gustav Meyrink’s The Golem takes its cues from the more recent tales of the creature created by Judah Loew Ben Bezalel (1525 – 1609) to serve the Jews of Prague (both protecting them from persecution and as a shabbos goi (which – I had to look this up – is a non-Jewish individual who regularly serves the Jewish community by performing those tasks which Jews are forbidden to undertake on the Sabbath). In the stories, he forms a creature from dust and brings it to life by placing paper with the name of God under its tongue. Unfortunately, Judah forgot to remove the paper and the Golem ran amok through Prague’s streets. This reminds me, in some ways of Mary Shelley’s 1818 novel, Frankenstein (for, I think, fairly obvious reasons). I’d imagine that it also informed Karel Čapek’s seminal Rossum’s Universal Robots; I do own a copy of this though I have yet to read it (I enjoyed War With the Newts, though). Interestingly, though the story is generally considered a folk tale from (at the very latest) the 18th century, Israeli literary commentator, Eli Eshed, believes that the story, in fact, emanates from an 1837 novel, Spinoza by Betrand Auerbach. The argument being that (though the word and many of the concepts associated with it weren’t new, the specific tale of the Golem of Prague was) that in the wake of Auerbach’s novel a whole host of stories sprang up, giving the impression of deeper roots within the Czech literary canon. This, though interesting, was gleaned from Wikipedia (the better sources I consulted on the roots of the Golem story were a little more circumspect on its origins, sadly). Regardless of the provenance of the Golem of Prague story, I find it a fascinating tale and Meyrink’s treatment of it is a wonderful piece of expressionist writing. Meyrink’s The Golem, though it draws loosely on the earlier tales, doesn’t follow them precisely. Indeed, the golem itself doesn’t feature prominently in the narrative. It does appear every so often (every thirty-three years, to be precise), but it is more a presence which haunts the Prague ghetto than a central character (that’s not to say that it is unimportant, however). Other characters are on occasion mistaken for the Kabbalistic golem, further blurring the lines between reality and fantasy. Instead, Meyrink’s novel is a fragmented glimpse into the life of Athanasius Pernath, an engraver. It opens with a nameless narrator, who, upon placing a hat upon is head which has written inside it the name of Pernath, finds himself experiencing a series of events (in his past) from Pernath’s life. This is, of course, reminiscent of the way that the Golem of legend was animated. Penrath, the gem engraver, has forgotten his past. The narrative, such as it is (not an insult – it’s superb), revolves around Penrath and his life in the ghetto. The novel follows Penrath’s encounters with a number of characters, including his neighbour Wassertrum, whose son was a crooked ocular surgeon. His friend, the kindly Hillel and a number of women, all of whom appear to, at various times, to be a potential love interest for Penrath. The various, tangled, stories for each character eventually lead to Penrath to being falsely accused of murder. Once he is released, it is into a ghetto which has altered almost beyond recognition. The prose of The Golem evokes the image of a place which is alive, if not entirely healthy. There was something unpleasant about that old man. I looked away from him, and gazed instead at the coloured buildings, standing there side by side in the rain like a herd of derelict, dripping animals. How uncanny and depraved they all seemed. Erected without plan, from the look of the, as fortuitously as so many weeds rising from the ground. Two of them were huddled up together against an old yellow stone wall, the last remaining vestige of an earlier building of considerable size. There they had stood for two centuries now, or it might be three, detached from the buildings around them; one of them slanting obliquely, with a roof like a retreating forehead; the one next to it jutting out like an eye-tooth. Beneath this dreary sky they seemed to be standing in their sleep, without a trace revealed of that something hostile, something malicious, that at times seemed to permeate the very bricks of which they were composed, when the street was filled with mists of autumn evenings that laid a veil upon their features. Many of the descriptions of the ghetto seem to me to be anthropomorphic, perhaps appropriate, given that the idea of the golem is an anthropomorphic being created from dust, or clay. Meyrink describes a place which is living, breathing and suffering through the industrialisation of Europe; by the time that the novel was set (the end of the nineteenth century) the Jewish ghetto in Prague had certainly descended into squalor and would soon see parts of it renovated. There does appear to be something of a rejection of industrialisation within this. I suppose it is feasible that the ghetto would have decayed without the influence of the industrial revolution on it, poverty doesn’t rely upon an industrial economy. However, many of the problems that arose in cities at this time are connected to the fact that many of them saw or had seen an inward migration of workers from the country. If there is insufficient housing, this naturally leads to overcrowding and its attendant problems. Furthermore, the novel draws on a Jewish supernatural story and there are references to eastern mysticism in the novel. From a literary point of view, I enjoyed this, though philosophically not so much. Having said that, Meyrink was clearly an intelligent man and, whilst he does embrace the supernatural and mystic, I think he interrogates it well. I worry a little that this seems unduly harsh. Of course, it’s fiction. The clue is in the word fiction; I just felt that, perhaps, he was exploring mysticism in an attempt to embrace it outside of his novel. Though, I should, once again, make clear that I don’t think that this impinges in any way upon the literary merit of the novel, or my enjoyment of the novel (high and very much indeed). It’s just something that occurs to me in my reading of the book. Meyrink was lauded by other writers, such as H.P. Lovecraft, who described Meyrink’s work as being the “most magnificent weird thing I’ve come across in aeons!” Borges can also be counted amongst those influenced by Meyrink. Given the (admittedly deserved) profile of both authors, it does seem a pity that Meyrink is less well remembered. This novel is a fine piece of weird literature which would appeal to fans of complex fantastical fiction. An excellent exploration of dream-like states, madness and the mind. It asks a lot of the reader, but you are amply rewarded. Fantastic stuff. This entry was posted in Review and tagged expressionism, gustav meyrink, novel. Bookmark the permalink.